History is relevant. History is now. Agricultural areas such as Camden have a mixed relationship with rain. It provides much needed relief and vitality to crops and livestock through the hot Australian summers, but, as with any good thing, too much is disastrous. 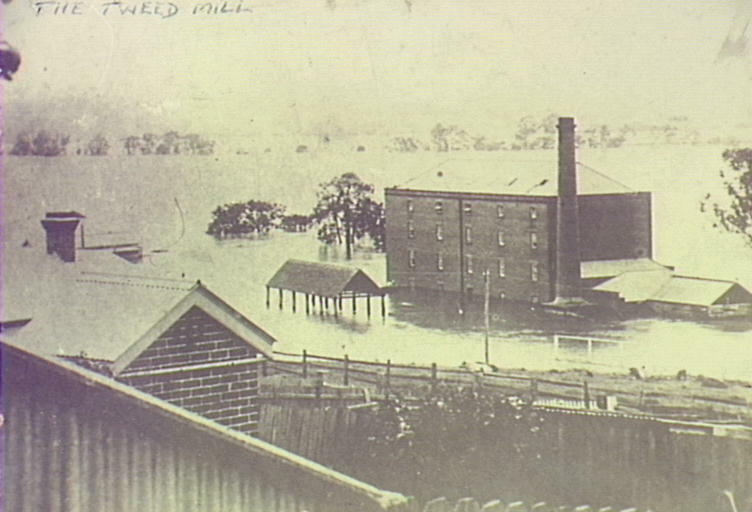 Thompson’s Mill inundated by the flood of 1898. Copyright: Camden Historical Society. Hazardous during the storms, the floods have inflicted damage on many notable Camden businesses. Thompson’s Mill, once the centre of Camden’s wheat industry, was heavily inundated by the 1898 flood. Thompson’s was by no means the only one that suffered damage, with many businesses and public buildings in the town, like the Crown Hotel, hit by the flood waters. It has also caused its fair share of havoc with travel in the area, most notably damaging Cowpasture Bridge on numerous occasions. 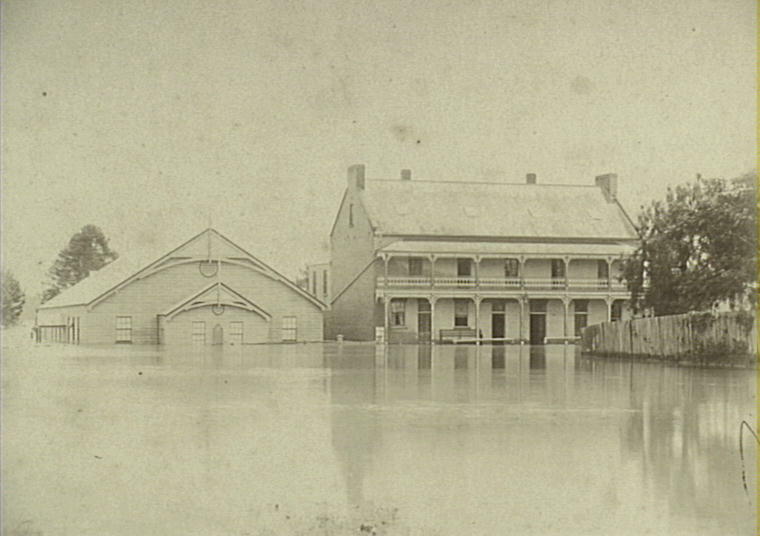 The Drill Hall and Crown Hotel inundated by the 1898 flood. Copyright: Camden Historical Society. One unique record in the Local Studies collection are extracts from the Camden News and Sydney Morning Herald from 1873 and 1898 covering news of the floods during that time. Although prone to exaggeration (it often describes the winds as “hurricanes”) it does provide an interesting and detailed record of the floods that hit. It details crop and stock losses and damage to various residential properties while describing the series of events of the storm and flooding. 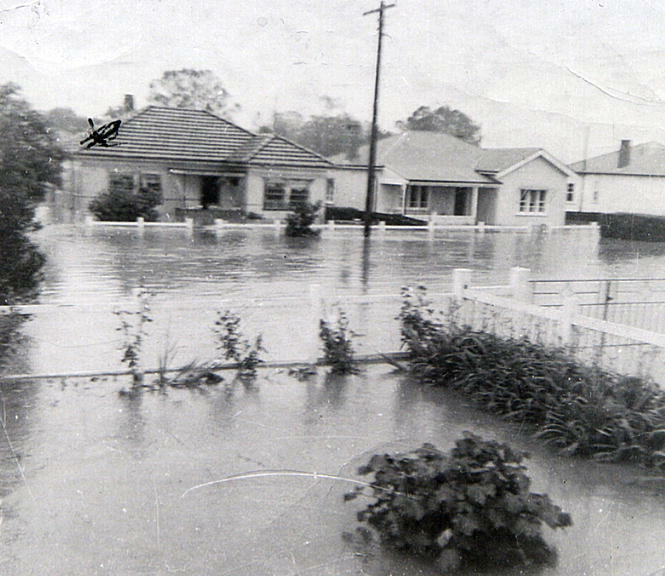 Homes in Edward Street at the mercy of the 1964 flood. Copyright: Camden Historical Society. Although causing damage and difficulty for the residents of Camden, there is a certain affection towards the flooding rains. One of the most notable parts of Camden is actually called the Flood Plain. Located only a few blocks from Argyle Street and the centre of the town of Camden, it is regularly submerged by the overflow of the Nepean River. 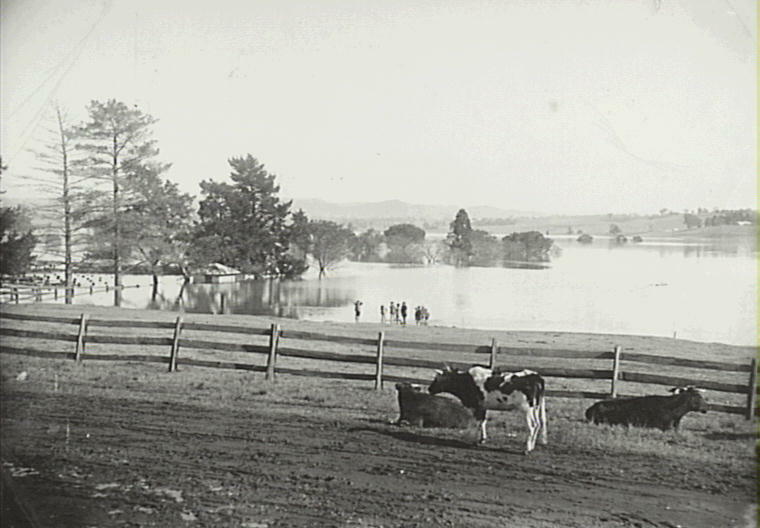 Despite being a regular site of flooding, the section of land has been home to many agricultural enterprises, including the Davies’ family dairy farm. The Camden Flood Plain. From Oxley Street on site of Camden Public School. Showing flood water over Showgrounds. Copyright: Camden Historical Society. Despite the strong association with flooding, drought often had similarly devastating effects. It was a drought that changed Camden’s primary industry from wool to wheat in the 1840s. The early part of the 21st century saw farmers experience a severe drought. It reached its peak in 2002, which also saw the price of cattle feed at its highest. It would continue for several more years, placing the local industry under severe strain. Tony Biffin, a local farmer, saw production drop 50 percent (Abrahams, 2006). The wine industry has an especially mixed relationship with rain and flooding. The 2008 downpour that saw the end of the long drought caused havoc for local wine producers. Camden viticulturist Bruno Carmagnola lost around $150,000 worth of wine grapes due to the timing of the rain (Abrahams, 2008). Had it arrived a few weeks later it would have saved the crop, but instead it caused a fungus to develop, devastating the harvest. Other producers such as Eddie Galea who grows salads and brassicas, experienced a decline of the crop, although the filling of the dams ensured hope for the following year. Not just a topic for small talk, the weather has been an integral part of life and prosperity throughout Camden’s history. Abrahams, L. (20/10/2006). “Drought hits hard”. The District Reporter. Abrahams, L. (22/02/2008). “The good and bad of a deluge”. The District Reporter. n.a. (n.d.) The Greatest Floods, 1873-1898: News Extracts from the Sydney Morning Herald & Camden News. Information used in the Changing Camden blog is from the resources of the Camden Library Local Studies Collection. The blog is written for historical interest and the views expressed are not those of Camden Council or Camden Library Service.